John Tavares' first NHL season has been a drama in three parts. In the first, he was a rookie sensation, scoring 15 goals in 31 games. In the second, he was just another kid who hit the wall -- scoring just 3 goals and amassing only 10 points in his next 38 games while often looking overmatched. But it's the third and final phase that has the New York Islanders feeling optimistic that Tavares is everything they hoped he would be when they chose him with the No. 1 pick in Entry Draft last June. Tavares matched the Isles' rookie record with a 5-point night in Vancouver on March 16, and he's continued to put up points (13 in his last 10 games) while helping the Islanders to a strong finish. "The first part of the year, offensively, he was everything that you'd want," Gordon told NHL.com. "He produced. But his battle level, his compete level, his second effort, are things that have gotten better with time. That part became better and the points dried up. But because of the work he did, now we're seeing him benefit from that work while he wasn't getting points. It's now paying dividends for him." 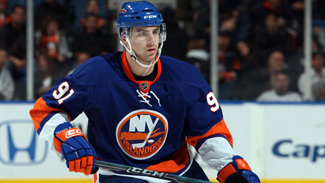 John Tavares and the New York Islanders are ending the season on an upswing. The Islanders, last in the NHL a season ago, entered Thursday's games with 78 points, 17 more than they managed in 2008-09. They've won three straight, five of their last six and are 8-3-1 in their last 12 games -- with a big assist from Tavares, who has 13 points in his last 10 games. Unlike last season, when they were eliminated from the playoff race by late March, the Islanders were technically alive until being eliminated Monday, when Boston got a point in an overtime loss to Washington. Tavares said he'll be sorry to see his first NHL season end. "When you're playing good hockey, you hate to see the season end -- but it will breed good things for next season." The Isles are headed for their third consecutive non-playoff season. But unlike the last two, their late-season showing and a core of young talent (and the likelihood of adding more with a high draft pick) have the Islanders and their fans optimistic better times are ahead. "We're building confidence here," Tavares said, "and when you have confidence, with a group of guys like us, it makes you feel good every day when you come to the rink. We believe we can win and we believe we can beat anybody. "We know we're close, and we're building. We're taking it one day at a time, and we're making strides as a team." Another thing that has helped Tavares is the Olympic break. "Mentally I got a little bit refreshed during the break and just refocused," he told NHL.com. "The look on things changed my approach on some things, and it's working. "I've been feeling pretty good for a while, playing hard. Things are starting to go in, go my way a little bit more offensively. I'm feeling good shooting the puck, and I'm making plays." Though Tavares told NHL.com he was feeling good before the Olympics, his coach said the two-week in-season vacation was just what his prized rookie needed. "The break came at a good time," Gordon said. "Mentally, he was beat up. He was frustrated at not being able to score. He was gripping the stick too tight -- whatever you want to call it -- he wasn't mentally relaxed. New he's got that second effort, his battle level has been raised. He's competing harder -- and combined with his ability, you know he's going to get chances and bury them." Tavares has one thing you can't teach: Hands. Several of his goals are highlight-reel efforts. He also sees the ice as few players of any age do. "He's probably in the top five percent in intelligence out there," forward Matt Moulson, who has spent much of the season playing with Tavares, told NHL.com. "He thinks the game as well as anyone." One big issue for Tavares has been strength. He's listed as 6-foot and 195 pounds, but if there's one fact everyone agrees with, it's that he needs to get stronger next season. "The more he matures, the stronger he gets, the more he realizes what he can and can't do in the League against these defensemen -- he's only going to get better," Moulson said. Teammate Kyle Okposo, now a veteran of 21 after being taken in the first round by the Isles in 2006, agrees Tavares has made significant progress in his first NHL season and that his scoring stats will climb next season and in the seasons to come. "He's improved a lot. His all-round game is a lot better," Okposo said. "His offense will come. He's so good around the net that he's able to make plays and put pucks in that other guys can't do. He's going to keep doing that as he gets older. He's very young -- he'll get bigger and stronger. No worries from me about him." Gordon agrees that more strength and greater familiarity with the League should help Tavares' offensive numbers climb next season -- he had 22 goals and 49 points with three games remaining in the season. That might not seem like a lot, but Steven Stamkos, the No. 1 pick in 2008, had 23 goals and 46 points in his first season (and played with the likes of Martin St. Louis and Vincent Lecavalier). Stamkos has 47 goals in his second season and could win the Rocket Richard Trophy as the NHL's top goal-scorer. "He probably could have had 70 points easily with the number of opportunities he had during that period where he wasn't scoring," Gordon said of Tavares. "When he gets stronger next year, he's going to be familiar with the League, familiar with how the game is played in the NHL -- it should become easier for him." Start of something big for Kane? Tavares told NHL.com his first season has been a learning experience. "I think I've learned what brings me success every day at practice and games, what I have to do to prepare, what I have to do to get ready and bring my 'A' game and help me succeed at this level," he said. "That's just growing through experience and learning the League and knowing what to expect every day. I think I'll only get better here as I get older and mature." But the 19-year-old said the learning process hasn't been confined to the ice. The Mississauga, Ont., native has been living with Isles captain Doug Weight and his family. He's learned about a lot of the every-day off-ice stuff that most of us take for granted. "I've been away from home, and it's been a new experience for me living on my own," he said. "I've learned how to clean the house, wash dishes and cooking. It's been good, and having Dougie right there with me has been huge. It's really helped me understand what I have to do." With the Isles' season ending after Sunday's game against Pittsburgh, Tavares is looking forward to taking some time off -- but he also wants to be ready for an improved sophomore season. "I'd like to go home, get away, take a break, see the people I'm familiar with and the place I've grown up with for about 18 years," he said. "I'm going to talk to the (Islanders) staff about a training program, what's good for me, what I need to work on and what's ahead. "We believe we have a great future ahead of us." Tavares has been in the media spotlight since he was given an exception to play in the Ontario Hockey League as a 14-year-old. To talk to him, it's easy to forget that were Tavares a conventional teenager, he'd be finishing his second year in college. Gordon said he often has to remind himself that Tavares, for all his skill and potential, is still just 19. "All the time," he said when asked by NHL.com about keeping Tavares' age in context. "I've said to him, 'Sometimes I forget you're 19 years old. Don't hold it against me; I certainly won't hold it against you.'"